Clark: Honey? I guess I'll have a Coke. Clark: No, I'll have it right here. 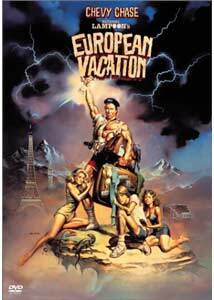 When I was about seven or eight years old I really wanted to see National Lampoon's European Vacation when it was released on home video. My parents, as was to be expected, deemed the language and sexual situations inappropriate viewing for my brother and me. Outraged, I voice my displeasure and was quickly shut up with the purchase of a candy bar. It is only now, after finally having seen European Vacation that I can honestly say that the candy bar was actually a pretty good deal. The plot, if it can be called that, is simply a backdrop against the certain hilarity that will come from seeing our loveable Americans get into extraordinary situations abroad. When the Griswald family wins it big on the television game show, "Pig In A Poke," they are whisked away to Europe for an all-expense-paid dream vacation. However, Clark (Chase) is more concerned with sticking to a strict schedule while his children Rusty (Lively) and Audrey (Hill) would rather be back at home partying. As is to be expected, things don't go according to plan and the trip becomes a complete disaster the likes of which can only happen to the Griswalds. The largest problem with the film is that there fails to be truly humorous, leaving a spotty mess that replays the same joke over and over again. In the course of their travels the Griswalds visit London, Paris, and Rome, only to relive the same experiences. Each time the group clashes with the locals, they inadvertently start some sort of uprising and then move on to the next place. The reason the first film worked so well was because there was a driving force behind their trip: they had to get to Wally World. Here it seems as though there is no sense of drive in the script, only an excuse to allow us to laugh at the customs and personalities of other countries, all the while loving our fellow ugly Americans. It would normally be enough of a flaw for the script to run the same jokes into the ground, but screenwriters John Hughes and Robert Klane have also found a way to incorporate dialogue and situations from the first film directly into its sequel. While I can understand the inclusion of some bits, the number re-used in European Vacation is a bit excessive. On the commentary track, Chase even goes so far as to recognize this and explains that one long passage of dialogue has been used in three of the four films in the series. This all brings us to Chevy Chase, a performer I grew up loving, and still do, regardless of his less than inspired choices as of late. There is something about Chase in the right sort of role that is positively winning, allowing him to rise above a mediocre script and add his own sort of humor to make things right. This is most evident here when, through all of the long dry patches, Chase thankfully makes the film worth watching. D'Angelo is fine here, as she always has been in this series, and her chemistry with Chase is never lacking. The two have a sort of rapport going that is not often seen in comedic films. The children, Dana Hill and Jason Lively, are each less than perfect in their performances, mainly Hill, who mostly annoyed me. Image Transfer Review: As the first Vacation film to be presented in a widescreen aspect ratio, European Vacation represents a sort of victory for fans of the series. Presented in a 1.85:1 anamorphic transfer, it looks very good given the age of the film. Colors are not vibrant due to a subdued palette, except the opening animation for "Pig In A Poke," which does look brighter and very clean with no bleeding. For the most part, the transfer does a nice job of rendering the browns and grays of Europe. It is generally very clean with no evident print flaws, aside from the opening logo for Warner Bros., while edge enhancement is nonexistent. Audio Transfer Review: The Dolby Digital mono transfer is as uneventful as you are likely to find on a DVD as of late. The dialogue coming from the center channel often lacks definition, and the crispness evident in so many current films is lacking in this mix. Extras Review: As perhaps the paramount reason I was looking forward to reviewing this film, this new DVD from Warner Bros. features a screen-specific audio commentary by Chevy Chase. Sadly the track is as disappointing as you are likely to find. Chase stumbles through, pointing out little anecdotes that are never very interesting. Take this example of one moment of the track: "(silence).... I find it interesting that in this film Griswalds is spelled with an 'a', but in the later movies it is spelled with an 'o'...(silence)..." I enjoyed moments of the track, but the majority of it is Chase describing the gags that are occurring on screen. Call me crazy but when I hear that Chevy Chase is doing a track I expect to be rolling on the floor with laughter, not yawning with boredom. The original theatrical trailer as well as cast and crew information round out the extra features on this disc. For those who enjoy the film, this DVD of European Vacation is well worth the low price that many stores are selling it for. But for those, like myself, who find the picture the low point in the series, only pick this one up if your goal is a complete set.